Sparing time to undertake tour and safaris to Uganda’s Jinja is chiefly about exploring the natural wonders that make Uganda the pearl of Africa and Jinja destination is one of Uganda tourism destinations which reward visitors on Uganda safaris with adventurous experiences which cannot be got elsewhere in the whole of Africa. The Uganda safari tour of Jinja offers visitors an opportunity to explore the source of the mighty River Nile. 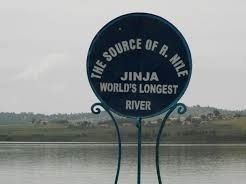 It is from Jinja that the world’s wonderful, longest River begins its massive, roaring journey through different countries to the Mediterranean Sea. The cheap one day tour to Uganda’s Jinja provides adventurous visitors the long awaited chance to participate in adventurous activities such as Water rafting and Bungee jumping, boat riding, at Uganda’s famous Bujagali falls. Taking safaris to Jinja takes one and half hours’ drive and about 80 Kilometers on the eastern part of Uganda from Kampala Uganda’s Capital city. Jinja home of adventure in Uganda can be explored in one day tours and safaris in Uganda and the highly adventurous tour can start early morning immediately after visitor’s breakfast, embark on drive transfer to Jinja via Mukono District, traverse through the wonderful Tea plantations in Lugazi which is also famous place of rest and healing of the Kabakas of the Buganda kingdom. Make a stopover at fast-food dispensers in Namawojjolo which is within Mabira forest where visitor on their safaris in Uganda can enjoy the views of the evergreen 312 tree species, enjoy the sights of some of bird species out of 300 individual bird species as well as some common primates found in Mabira forest. After mighty stopover, get back on the vehicle and Proceed to Jinja having Lunch at Nile Resort Hotel, after the delicious lunch, visitors will take a short ride to the mighty source of the Nile which is tranquil places, dotted with beautiful tropical pants, palm trees and magnificent eye attracting white roaring water of the mighty Nile. Upon reaching the source of the Nile, tourists on their safaris to Uganda can spot where the river starts its wonderful long journey to the Mediterranean Sea in Egypt, watch the local fisher men throwing their fishing nets in water and take great, participate in taking wonderful looking photos for future memories and also to show the home people that you were in the pearl of Africa where the source of the river Nile is found. While at the source of Nile, one can also have chance to view the unique bird species especially the King fisher and Participate in the afternoon white water rafting in the Bujjagali falls and those interested in Bungee Jumping can participate. After that memorable, adventurous experience, visitors will drive to Jinja town for short tour mainly to view the different Indian styled structures which many Indians lived before they were evicted by president Amin. Also enjoy the sight of many shops located along the Jinja main road and visitors can buy Ugandan Crafts and after all that visitor on Uganda safaris and tours will come to prove that Uganda is the pearl of Africa and Jinja is paradise of adventure.